ABSTRACT Aprataxin, defective in the neurodegenerative disorder ataxia oculomotor apraxia type 1, resolves abortive DNA ligation intermediates during DNA repair. Here, we demonstrate that aprataxin localizes at sites of DNA damage induced by high LET radiation and binds to mediator of DNA-damage checkpoint protein 1 (MDC1/NFBD1) through a phosphorylation-dependent interaction. This interaction is mediated via the aprataxin FHA domain and multiple casein kinase 2 di-phosphorylated S-D-T-D motifs in MDC1. X-ray structural and mutagenic analysis of aprataxin FHA domain, combined with modelling of the pSDpTD peptide interaction suggest an unusual FHA binding mechanism mediated by a cluster of basic residues at and around the canonical pT-docking site. Mutation of aprataxin FHA Arg29 prevented its interaction with MDC1 and recruitment to sites of DNA damage. 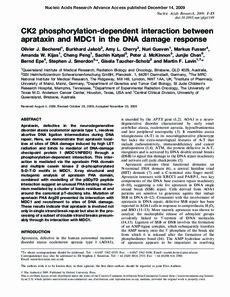 These results indicate that aprataxin is involved not only in single strand break repair but also in the processing of a subset of double strand breaks presumably through its interaction with MDC1.